With significantly low costs and a sales pitch of almost no medical tests (for sum assured up to Rs 50 lakh), online term plans have become quite a rage. Almost all companies offer such plans. The latest to jump on the bandwagon is Life Insurance Corporation of India (LIC), the largest in the segment. Compared to offline plans, which are sold through agents and banks, online plans have lower premia (30-50 per cent lower). Offline term plans are more expensive and these aren’t pushed by agents. Typically, people buy policies with a lower sum assured, say Rs 20 lakh, when they are young. When they have dependents, they might seek to increase the life cover significantly. Such people can buy an online term plan, while paying lower premia. “The savings can be significant, even if you are purchasing an online plan of a higher sum assured after five years,” Dahiya says. If someone aged 25 buys a life cover of Rs 1 crore for a period of 30 years and a premium of Rs 12,000 and wants to shift after five years, the premium will be only Rs 8,000, provided there are no changes in his health conditions, habits, occupation risks, etc. Offline plans offer the advantage of an intermediary---an agent or an advisor. These entities act as a one-stop shop for all customer queries, service requirements and policy updates. In addition to being cheaper, online plans offer hassle-free purchase and faster application process. Today, insurance companies also offer real-time customer service support and educate customers about product features and benefits, while they make purchases online. “Wherever there is good service from advisors and the assurance of ‘face-to-face’ interaction, it works as a big comfort factor for customers purchasing offline plans. However, with e-commerce picking up exponentially, the online insurance sector, too, is seeing a paradigm shift and customers might shift to online plans that offer the same benefits as their offline counterparts, but at a much cheaper price. With more customers realising the savings advantage with online plans, we expect more shifts,” says Rishi Piparaiya, director (marketing and direct sales), Aviva Life Insurance. One should never surrender an old plan or allow it to lapse before securing a new one, cautions Deepak Yohannan, chief executive of MyInsuranceClub.com. “The underwriting might be stronger or more stringent in online plans, as these are very cheap. So, companies might not want to take the risk and you might be rejected, even with minor, non-critical illnesses. So, policyholders should be careful that they first get a new plan before giving up the old one,'' he says. 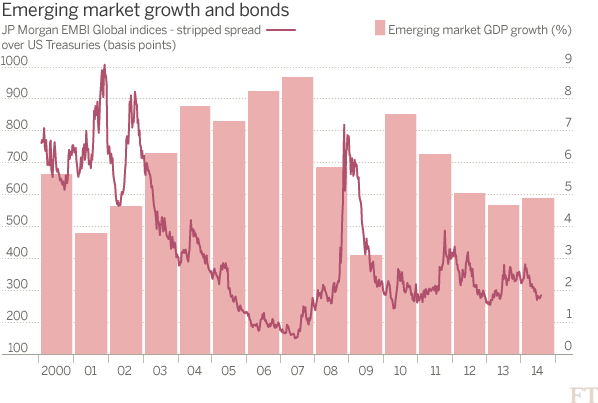 FT points to an apparent "breakdown in correlation between risk and reward" on emerging market (EM) bond yields. As the graphic below shows, the premium (as reflected in the spread over US Treasury Bonds) required to invest in EM bonds, which was inversely related to EM GDP growth rates before the sub-prime meltdown, has stayed low despite declining growth in these economies. So, what gives? The conventional explanation, as outlined in the FT article, attributes this to a "search for yields" in an environment where developed markets suffer from ultra-low interest rates, excessive credit supply from quantitative easing, and economic weakness. All of this has made EM's with their relatively higher interest rates and better economic prospects more attractive. The flip side with this being that once the developed economies recover and interest rates rise, the reversal of capital flows will drain EM bonds and restore business as usual with EM bond yields. However compelling this argument, certain deeper structural factors may also be at play here. In particular, the secular stagnation hypothesis, being advocated by economists like Larry Summers, may have an echo in the EM bond trends. As Summers explained in a recent interview, secular stagnation refers to the inability in developed economies for "investment to absorb all savings". The attendant consequence is one of a lower trend financially sustainable (in the absence of any bubbles) growth rate for these economies and possibly a lower trend interest rate. If this were true, and there are several compelling arguments in favor, then there is a strong likelihood that the EM bond trends go beyond a mere "search for yields" to a "search for investment opportunities". This would in turn seek to permanently narrow down the spreads between EM bond yields and US Treasuries. In that case, the long positions on EM bonds may not turn out as bad as is being portrayed by conventional wisdom today. 1. Change the Country of Residence even if the trip lasts no longer than a month. 2. Share the location every now and then. And it all starts from the airport. 3. Suddenly they start sharing those strange night club pictures of them to give you an idea of all the fun they’re having. 4. You’ll find them commenting/sharing posts in English with terms like Yo, Man, Wanna, Ballz! Also Read: What if a time travelling mail box could deliver a letter to a 10 year old You? 5. All this pride they get in adding Angrej ladkiaan in their friend list. 7. Now half of their posts and pictures they share are about India and all the love they have for their home country and its people. Is taxation the binding constraint? For the new government in Delhi seeking to kickstart the economy, the forthcoming budget will be a litmus test. 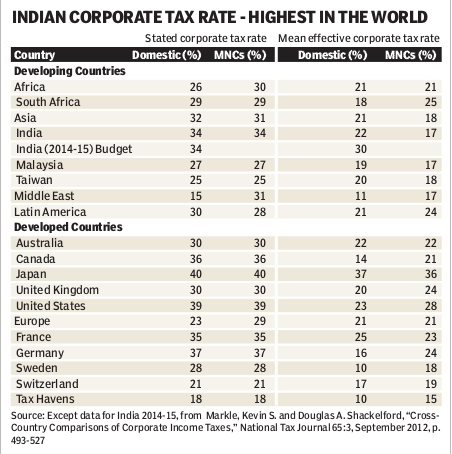 Lowering corporate tax rate is at the top of the wish list for corporate India. 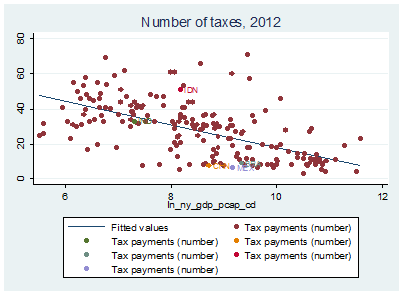 But is taxation a binding constraint on private investment? 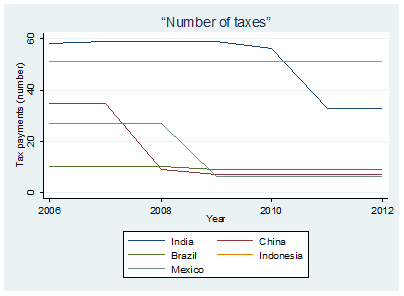 The graphics below compare several taxation related parameters for India with that of other countries, and the trends in each parameter for India, China, Brazil, Indonesia, and Mexico. 1. 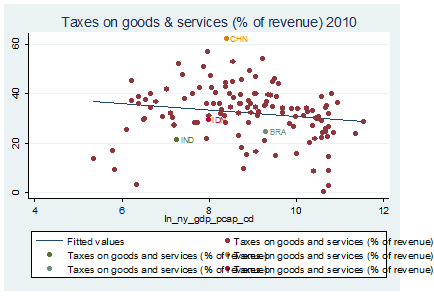 Number of taxes - For countries with similar level of economic development (measured by GDP percapita), Indian firms do not face too many taxes, though when compared to China, Brazil, and Mexico, they pay more numbers of taxes. However, there has been a declining trend in recent years. 2. Taxes paid on procuring goods and services as a percentage of firm revenues - India has among the lowest tax expenditures on purchases of business inputs. Further, it has been declining steadily. 3. 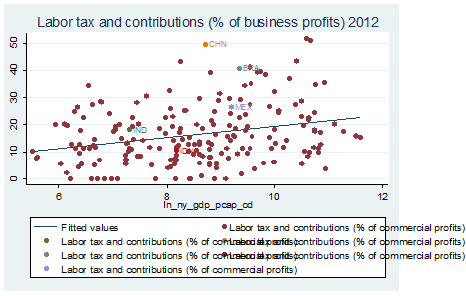 Labor tax and contributions as percentage of business profits - Is lower than all its major competitors, except Indonesia. Further, among similarly placed countries, its labor tax contributions are only slightly above the average. 4. 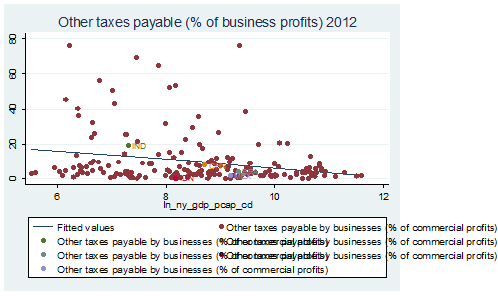 Other taxes payable as percentage of business profits - Includes property taxes and other smaller taxes levied by local governments etc, over and above the corporate tax. Though it is just about the average paid by firms in other countries with similar percapita GDP, it is higher than that paid by other competitors. 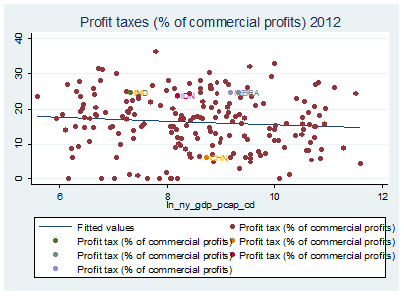 5.Taxes on profits as a percentage of commercial profits - Is about the same rate as that paid by its competitors (except China), though it is higher than for countries with similar per capita GDP. 6. 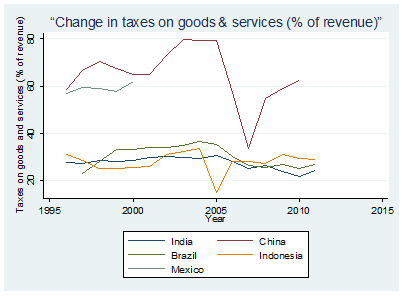 Effective corporate tax rates - Is about the same as in other developing countries, in fact among the lowest for MNCs. The effective tax rate estimate of 30% for 2014-15 is just fiction. Obviously, left to themselves, businesses would like to pay no taxes. But the more relevant question is whether business activity is being seriously constrained by high taxes, especially in comparison to our competitors. Maybe there is a case for rationalization of tax administration, so as to make it easier to file and pay taxes, and also bring down the multiplicity of taxes. But there is nothing here that to suggest that taxation is a binding constraint to private investment. I’ve been dating a great, loving and caring woman for a year and a half. She’s in her early forties – eight years older than me – and works as a senior manager in a big company; she earns around Rs.11,00,000 pa, and her company provides a car and a flat. I am about to finish my Part time MBA and my Income is Rs.700,000pa. We’re in love and think it’s about time to move our relationship to the next level – which is moving in together. However, I feel that my girlfriend is stingy towards me. I’m the one who treats at posh restaurants and buys expensive gifts, and when we spoke about me moving into her flat she said that I’d have to pay the bills in return. I’m finding it silly to mention such things, but they do annoy me. Am I shallow, greedy and opportunist? I understand her pay isn’t supposed to be a perk of our relationship but I must admit that, deep inside, I feel that a better lifestyle out of it wouldn't go amiss. Your girlfriend is testing you, and you are at risk of failing. Naturally she is pleased to have a young, intelligent boyfriend, but she is worried that you only love her for her cash and will dump her for a younger model once you have a decent income of your own. So she is using a “screen”, as described by Nobel laureate Michael Spence. By ensuring that she remains a cost center rather than a cash cow, she is creating a situation that would be intolerable to a genuine gold-digger. She wants to see how you react, but by assuming that the “next level” is a free apartment for you, rather than a proposal of marriage, you are simply confirming her fears. Forget the flat, buy her a diamond ring, and she will mellow. All this assumes, of course, that she is not just a miserly sociopath. Either way, good luck. Excessively optimistic traffic forecasts are a feature of road concessions across the world. 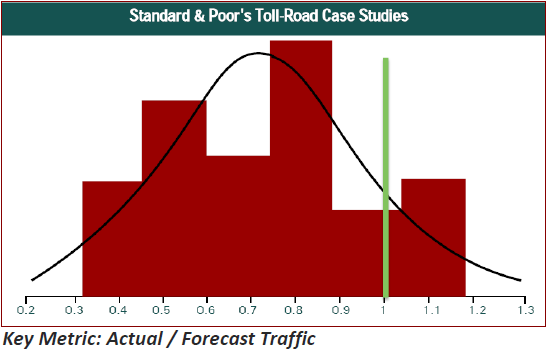 An S&P study of 32 these projects across the world found that actual traffic was less than forecast in all but four of them. The average actual traffic volumes were only 73% of the forecast volume. A CRISIL study of 15 NHAI projects shows that traffic growth in passenger car units (PCUs) was just 3-4% in 2011-12 and 2-3% in 2012-13, as against 7-8% in the 2006-11 period. This slowdown is due to the slowdown in commercial vehicles traffic, which account for over three-fourths of total traffic. In another analysis of 6 NHAI projects, it found that base traffic was 20-40% lower compared with NHAI estimates and average project returns 8-14% compared with the 22-26% based on NHAI traffic and cost estimates. This meant that 5 out of the 6 projects had average debt service coverage ratio (DSCR) of less than one in the first five years of the operation, thereby making debt restructuring inevitable. Re-negotiations invariably follow. It is for this reason (and also cost over-run due to construction delays) that governments in UK, Australia etc include an "optimism bias" into their calculations while evaluating infrastructure project bids. The "bias" is the difference between the bid parameter and the average of its actually realized valuation from all previous projects. It is also the reason why EPC contracts, bundled with medium-term operation and maintenance activities, are gaining favor over BOT PPPs. The real value of the rupee has been a matter of considerable debate. In the last three years, the rupee has suffered two instances of sharp declines. First, from July 2011, for nearly a year, the rupee fell 16%, and then, from May-September 2013, it declined 14%. Both followed periods of elevated inflation, rise in current account deficits, and episodes of (exogenously induced) large capital inflows. In this context, the real effective exchange rate (REER) is a more reliable basis for assessing the valuation of rupee. 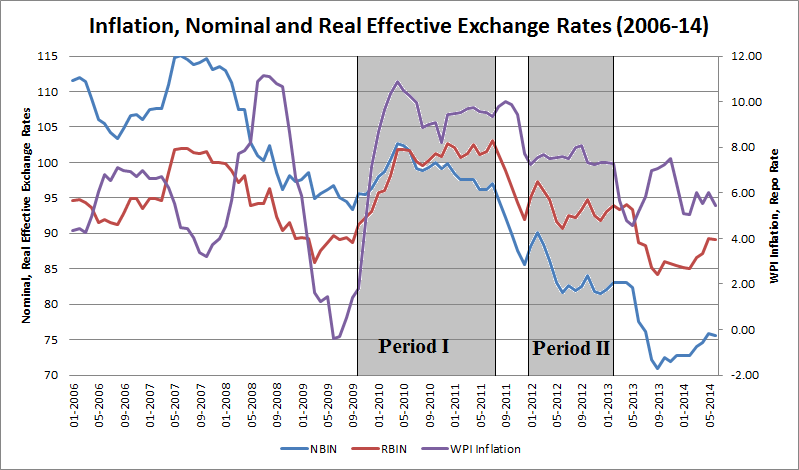 It takes into account the trade weighted exchange rate discounted by respective inflation rates, which gives a more accurate measure of the relative competitiveness of an economy with respect to its competitors. 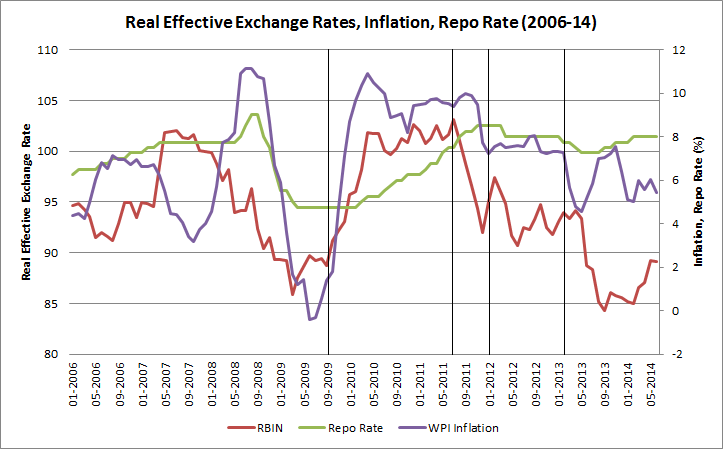 Two observations based on data from RBI, BIS and the Bruegel Institute. 1. Despite the persistent high inflation since mid-2009, the REER remains at about the same level today as it was then. In fact, both instances of sharp depreciation followed periods of REER not responding despite inflation remaining elevated for more than a year. Something had to give. Given the high inflation, it is only natural that the volume of goods that can be purchased with the same amount of your currency decline. This was all the more so since among all our major trading partners, India had one of highest inflation rates. The exchange rate had to decline sharply to reflect this. The first period coincided with the aftermath of the global financial crisis and the flight of capital into emerging economies in search of yield, coupled with a series of seven rate increases at a time when rates were falling elsewhere. The second period coincided with the peak of the third round of quantitative easing in the US and the Eurozone crisis which again triggered another round of capital flight into emerging economies. In both instances, sudden-stops were followed by sharp depreciation. 2. The comparison with its emerging market peers is also important. 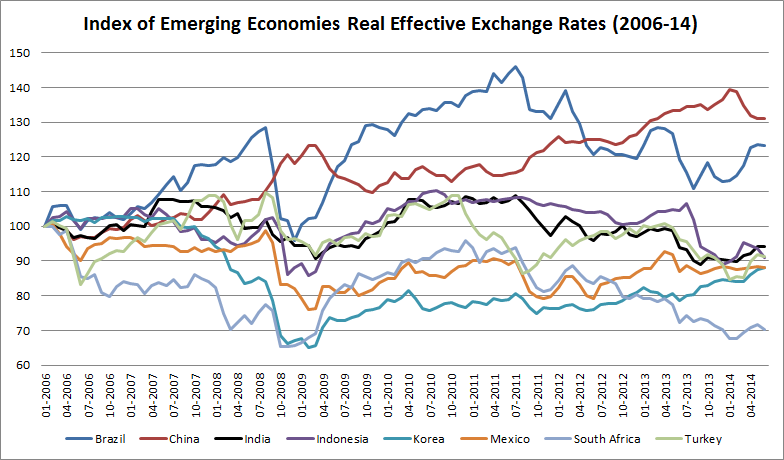 Compared to most of our competitors, the REER of the rupee remains elevated. Despite the persistent high inflation, the REER of rupee today stands at exactly where it was five years back. Leaving aside China and Brazil, the rupee appears over-valued compared to all other competitors. In a recent column Arvind Subramanian and Martin Kessler examined the valuation of rupee with respect to Balassa-Samuelson effect (the positive relationship between PPP prices and GDP percapita) and found the rupee under-valued by 30%. In other words, assuming the relationship to hold, the rupee appears 30% under-valued. However, this theoretical approach over-looks an important structural shift in the Indian economy - the near doubling of the share of tradeable sector from 24% of GDP in 2004 to about 43% in 2012. This would have had the effect of attenuating the rise in aggregate price levels due to non-tradeables, thereby minimizing the Balassa Samuleson effect for the period under consideration. In the circumstances, for atleast the short to medium-term, further declines in the value of rupee may be both desirable as well as forthcoming. There are plenty of myths about women and money and it's important to bust these myths wide open. But people also have misconceptions about men and money. Here are just a few. Myth #1: Men are financially savvy. The societal expectation is for men to be viewed as the financially savvy one in the relationship. However, many men prefer to let their wives or girlfriends handle the money. The reasons vary from “She is really good with money” to “I really prefer to not think about it.” Sound familiar? Yes, many of the same reasons women don’t learn more about finances also apply to men. So don’t make an assumption that just because a client sitting in front of you is a man, he is financially savvy. Instead ask. Myth #2: Men like to control the family finances. In the traditional 1950s home, the husband made and managed the money and the women stayed at home with the children. Nowadays, this societal expectation is no longer true. Many modern couples manage money together and prefer to share responsibilities. Unfortunately, there is still pressure for men to act as if they prefer to be in control but know that in many couples this is not true. Some men even let go of their control to a fault and need to be pulled back into the advisory meetings to make sure they are up to date on the family financial plan. Myth #3: Men are money motivated. The truth is some men are money motivated and some are not – and that is okay. Men who are profit motivated tend to select careers that reinforce this trait such as finance, business, and sales. However, many men select careers based on their interest in helping others and/or solving a problem. These guys end up in counseling, healthcare, engineering, or academia. Myth #4: Men don’t like economically powerful women. Some men feel threatened by women who make more than they do; however, many more love the idea of a smart, intelligent woman who is empowered to earn her worth. These men tend to have high self-esteem and high regard for women in general. Unfortunately, too many women still fear this myth is true and downplay their accomplishments when dating or out in public with their spouses. Myth #5: Men make better advisors. Gender does not determine an advisor’s effectiveness with clients. The ability to be empathetic, competent, and credible is. Although the industry is still male dominated, this is not because men make better advisors. It is simply because women have not been encouraged to enter this field. As someone who loves working with and hanging out with both men and women, I encourage you to bust some of these myths wide open by not making assumptions about your clients and your colleagues. Instead, ask questions and find out what makes the men in your advisory practice and in your life tick. Modern love can be summed up in one quick status update: It's complicated. In the second of a three-part series, we explore the role money plays in relationships.